Making music publicly without permission was a punishable offence in the GDR. For the freedom of art, opposition groups in Leipzig therefore organized a street music festival. As expected, this was banned by the authorities. 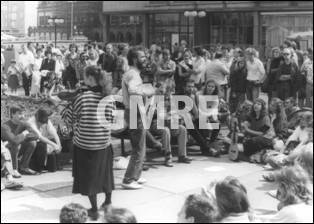 Nevertheless many musicians from all over the GDR met in Leipzig on 10 June, 1989, and played to the delight of passers-by until lunch hour in the city centre. Around 12 o’clock the Volkspolizei came forward and violently forced the musicians with their instruments and also bystanders onto trucks. The arrests continued until the afternoon. Shortly before the beginning of the motet of the Thomanerchor almost all of the remaining musicians were surrounded in front of St. Thomas' Church at the Bach Memorial and also arrested. Of the 84 arrested 53 came from outside the Leipzig district, a fact which also troubled the SED. Many witnesses took exception to the attacks by the security forces which caused terror and confusion. Thus spontaneous solidarity actions took place until evening.